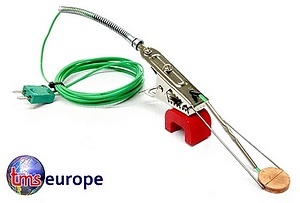 Industrial suface probe that uses a strong pull magnet clamp onto metal surfaces in any direction. The copper disc houses a type K thermocouple which is mounted to a crocodile clip by spring steel. Terminated in 2mtrs of PTFE lead and miniature plug.